This past month has given us our first peek at what could be considered a �teaser poster� for Peter Jackson�s King Kong, an evocative image that has predictably spurred discussion and debate on the boards. It�s a fairly unconventional composition that creates a sense of tension; Ann Darrow trapped between cold, reptilian savagery and the more ambiguous, for-now-quiet ferocity of Kong. A rock and a hard place, to be sure. But, you know what? It doesn�t hold a candle to the impact made by the teaser poster for�get ready�the DeLaurentiis King Kong remake of 1976. On November 30, 1975�almost exactly thirty years ago�the New York Times printed an ad for a film that wouldn�t be released for over a year. 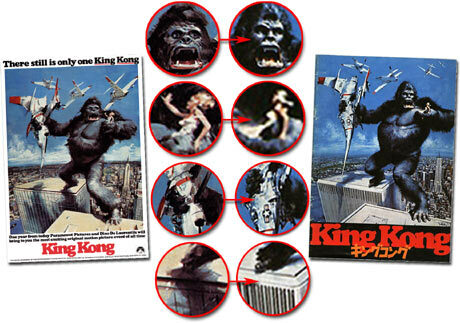 Across the top of the image were the words �There still is only one King Kong��a calculated stab-in-the-eye aimed at Universal, which had run their own Kong ad weeks before�and at the bottom was a coupon offering a free copy of the poster. Paramount assigned a single person, Christabel Winerman, to deal with the anticipated requests. The day after the ad ran, Ms. Winerman was presented with a box containing 219 letters. The next day, four thousand appeared. On the third day, eight thousand letters showed up. Ms. Winerman was given some help; eventually sixty thousand requests for the poster came in. Still, none of this filtered down to flyover country. Remember, there was no internet in 1975; information and images did not disseminate with today�s lightning speed. My first glimpse of the image�and I remember the moment very well�occurred in my 6th grade classroom as I unfolded the poster from the back of a brand new DYNAMITE magazine, the Scholastic School Book Club�s �hip� periodical. Mrs. Tepley had just handed out the new book orders (remember how exciting book order day was?) and I couldn�t wait to see the giant gorilla. My friends Lonnie and Todd gathered in to share the experience. The poster was in the back of the magazine, folded twice. By happy accident, when you flipped it open you saw half of the poster: Kong revealed from the waist up, blonde captive in one hand and crushed fighter jet in the other. The face jumped right out at you�and it was one of those moments where guys simultaneously go �Whoooaa!� We were taken aback; it was a quite surprising and quite frightening image. Not really a gorilla, but sort of Yeti-like creature with a Phantom of the Opera skull-like nose. Glorious. Unambiguously awesome. It hung on my bedroom wall for the rest of the decade. I still own that very poster. The image was created with impact in mind. In 1975, Paramount and Universal were locked in a long court battle over which studio ultimately had rights to produce a Kong remake. Within moments of a court ruling that cleared the way for both studios to proceed, Paramount chairman of the board Barry Diller reached his vice-president of worldwide marketing, Gordon Weaver, in the first class lounge of British Airways; he and the Paramount marketing group were about to fly to London to scrutinize films being produced there. 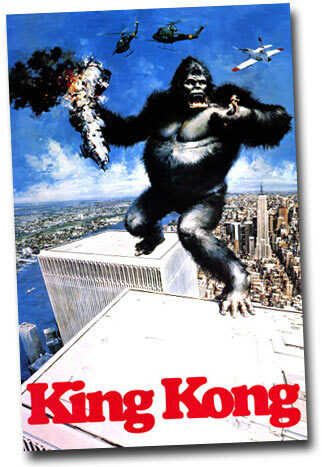 Weaver remembers his simple instructions: �Barry Diller told us to create a poster that would blow Universal�s �Kong� out of the water.� And they needed it now. The traveling group consisted of Weaver, executive director of advertising Steve Rose, executive director of publicity William O�Hare, executive director of marketing/administration Jeffrey Katzenberg, and director of special products Mildred Collins. They convened in the airport terminal, regrouped on the flight to London, and continued at the Dorchester Hotel in London where they were joined by Diller. Steve Rose placed calls to three ad agencies and asked for concepts ASAP. According to Gordon Weaver, this is where the relocation of Kong�s final stand occurred. 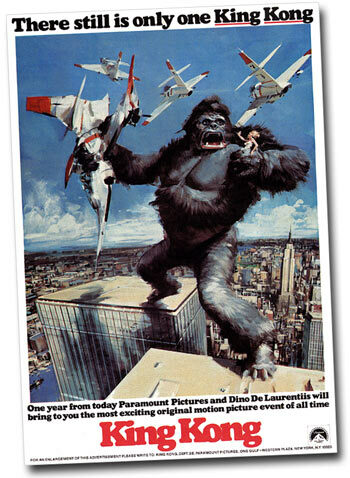 �Dino�s original script and concept had King Kong back on the Empire State Building,� he explained to me. �Because of our advertising art the location was moved to the twin towers of the World Trade Center.� Indeed, the September 30, 1975 script draft by Lorenzo Semple, Jr. uses the Empire State Building, and the December draft switches to the World Trade Center. 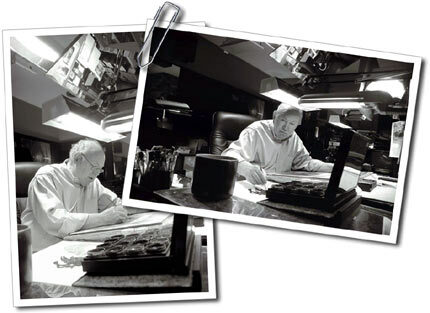 Artist John Berkey in his studio. The Deiner-Hauser advertising agency contacted John Berkey, a Midwestern artist known for his science fiction work and posters for The Towering Inferno. 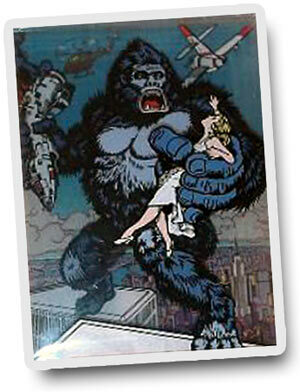 �They wanted an aircraft in one hand, with Kong straddling the two towers,� Berkey recalls. �That was about all I was told. I was given no guidance on the ape�just do an ape, basically.� Jessica Lange had not yet been cast, so Berkey had to render a generic blonde in the hairy paw. The sketch was needed the following day. Ball point pen drawings were sent to New York that morning on what was an early fax machine called a telleprinter. One of the drawings was approved and the sketch was complete and delivered the next day, Friday. 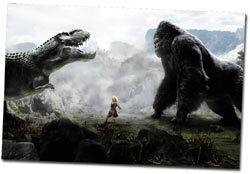 It appeared in the New York Times on Sunday to announce the remaking of King Kong. A very quick beginning! That�s the type of hubris and hyperbole that ultimately doomed the film, but at this stage of the game it utterly buried Universal�s hopes to produce their own remake. The ad hit like a ton of bricks. The version printed in the New York Times was what Berkey refers to as the �color sketch.� Paramount immediately commissioned a tighter final version of the painting; Berkey had never been to New York, so Deiner-Houser hired a photographer to shoot reference photos from atop the WTC towers. They also asked for six additional illustrations to be completed in two weeks. Remarkably, Berkey met the deadline, producing a group of powerful images that became ubiquitous on everything from posters to beach towels. Berkey corrected the painting by working right on top of his first draft, sanding and repainting. He remembers having to labor over the �wreckage� in Kong�s right hand in order to avoid tension with The Canadian air force, from whom DeLaurentiis hoped to get the use of some fighter jets. �They didn�t want their aircraft shown in flames,� Berkey recalls. �So I was told to make it �unidentifiable rubble.� It ends up being sort of a blob.� He would use these opportunities to add and correct details on the various buildings seen in the background. It was only after his paintings began showing up in print and emblazoned on magazines, t-shirts, puzzles, posters, cups, games, pillows, wallets, etc. that Berkey noticed that each image used the exact same face. Someone in the Paramount promotions department decided that the public would think an army of giant gorillas was invading New York if different faces were seen on each poster. Thus, without the benefit of Photoshop, an anonymous retoucher pasted identical faces on each Kong figure, painting fur on the edges to hide the seam. But what did the original faces look like underneath the paste-ons? No one has seen them in over thirty years � until now. Watch this space next week for a look at the original paintings before they were adulterated, as well as an in-progress shot of the iconic WTC image. In the meantime, send a jpg of your favorite version of the Berkey poster to kongfiles@kongisking.net and I'll post the oddest ones in the next column. Here's my contribution to get you started. 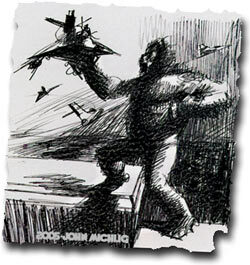 THE KONG FILES and contents are © 2004-2006 John Michlig and written for KongisKing.net, subsidary of The One Ring®, Inc.
ArtOrg would like to announce the gallery show of Mr. John Conrad Berkey. John is one of the treasures in the world of illustration, and was named by the 104-year-old Society of Illustrators to its Hall of Fame just last year. Other Society Hall of Fame members include Norman Rockwell, N.C. Wyeth, Frederick Remington, and John James Audubon. We will be showcasing over 50 original works which span the entire career of John Berkey from his early days working as a calendar artist at the Brown and Bigelow company in Minneapolis to his space paintings which have become the archetypical symbols of many science fiction works by Asimov, Heinlein, and others. Previously unseen works from John of the human form will also be shown. The gallery opening will be at 6pm Friday, November 4, 2005 at the ArtOrg Moving Walls Gallery at the riverside entrance to 200 Division Street in downtown Northfield, Minnesota. Further gallery show times and dates in November are to be determined. A special treat will be the world premier screening of several of John�s experimental video productions. John has taken many of his fully-realized paintings and set them to music, weaving in and out of the images, panning and zooming across one image only to fade in to another. He has thereby created deeply distinctive descriptions of his various works in subject groupings such as American history, space travel and others. These video works will be premiered on Saturday, November 5 at 7pm in Boliou Hall at Carleton College in room 104. Boliou Hall is located on the main campus of Carleton College on north edge of the main campus overlooking Lyman Lakes. Thanks to the Cinema and Media Studies department for the use of their wonderful facilities.